Service dogs are dogs that are trained to assist the owner in mobility, psychological support, and medical alert for conditions (such as seizures and diabetes). Can any dog become a certified Service Dog? Not necessarily. 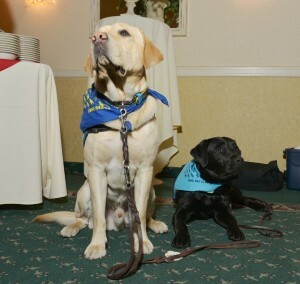 Service Dogs require some natural characteristics such as being confident and social. They cannot be high strung, aggressive, or have any major behavioral issues. What are the benefits of having my dog certified? Certification increases public confidence in teams. Certification increases confidence of current or future employers and helps to smooth the transition into the workplace. Certification provides assurance to evacuation shelters, so that in times of disaster the authenticity of your service dog team will not be questioned. Certification is beneficial when answering any legal questions regarding your service dog: though the law provides for public access for service dogs, you may be required to provide proof that the dog in question is actually a service dog. What is required of a Service Dog? Since a service dog is required to be in public (and often times confined) places, it is vital that they are: well trained (obedient), social, confident, and perform at least 3 tasks for the owner that is specifically related to their condition. What are the requirements of me having a Certified Service Dog in Northern Virginia? The dogs must have passed the Canine Good Citizen Test (or equivalent) no earlier than their first birthday. If a dog has taken and passed the test prior to the first birthday, then the test must be taken again. The dog must be at least 18 months of age. The dog must have their current County license tag as well as their name and phone number identification tag displayed on their collar. The dog must have proof of up to date vaccination, spay or neuter and a letter from a veterinarian (dated within 30 days of test) stating that the dog is in good health and able to perform their service duties. The dog must have been trained to perform at least 3 service tasks related to hearing impairment, mobility impairment, medical alert or psychological assistance. This test is not designed to certify guide dogs for the blind. The dog must be clean and properly groomed. The handler must have a letter from their treating physician simply stating that they are being treated for a disabling medical condition. We do not require any individual or their treating physician to disclose the nature of the disability. That really depends on how much work you have done with the dog prior. It could take weeks or even months. What organization are you certified under? We are certified Service Dog Evaluators under FSDS (The Foundation for Service Dog Support) which is a non-profit 501(C)(3). What if I have trained my dog on my own, but I want him/her certified through FSDS? Once you submit your paperwork, they will give you the go ahead to contact us and we can then evaluate your dog for certification. If my dog has aggression issues with other dogs or people, can they still be a service dog? If your dog has aggression or major behavioral issues, those would need to be fixed before they could be a certified service dog. Service dogs are required to go in population public places; therefore, it is important that they are well mannered, friendly, obedient, and confident. 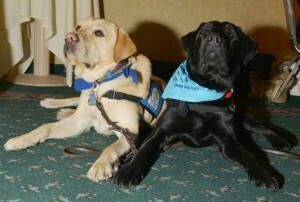 Do you all provide Service Dog Training in Northern Virginia? Yes, we can give your dog the obedience and skills needed to be a certified service dog. See the prices page of our website for more information.